Citrus heart rot is an infection that causes the trunks of citrus trees to rot. It is also known as wood rot in citrus and bears the scientific name of Ganoderma. If you are wondering what causes citrus ganoderma, read on. 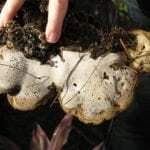 We’ll fill you in on the causes of ganoderma rot of citrus as well as what steps to take if this happens in your orchard. If you grow citrus trees, you should keep an eye out for different diseases that can attack your orchard. One fungal disease is called ganoderma rot of citrus or citrus heart rot. The first symptom you might observe indicating that your tree suffers from citrus ganoderma rot is a general decline. You might see some leaves and branches dying in the canopy. After a while, the fungi move up the tree from the roots to the crown and trunk via strands called rhizomorphs. These strands ultimately form brown mushroom-type structures on the bottom of the citrus trunks. These grow in the shape of fans. What causes citrus genoderm? This type of wood rot in citrus is caused by the Ganoderma pathogen. The ganoderma infection rots the wood and causes decline or death. Ganoderma pathogens are fungi. They generally enter citrus trees through some kind of wound in the trunks or branches. 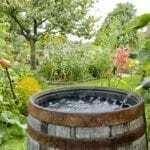 However, when you cut and remove mature, large trees from your orchard, their stumps can serve as sources of inoculum. This can result from airborne spores or else from grafting of infected roots. If you replant young trees near infected stumps, the fungus can be passed to the younger tree even when they are not wounded. When young trees are infected in this way, their health often declines quickly. They can die within two years. Unfortunately, by the time you see symptoms of citrus heart rot, the disease has caused problems that cannot be cured. Older trees with wood rot in citrus will lose their structural integrity and their branches may fall. However, they can produce for years despite the issue. On the other hand, this is not the case when citrus ganoderma rot attacks young trees. Your best bet is to remove and dispose of the infected tree.